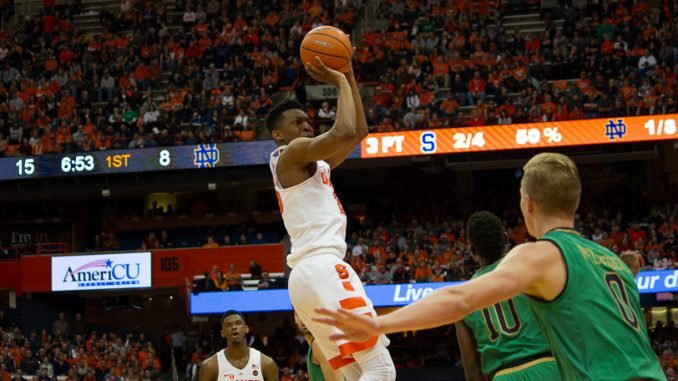 Tyus Battle shoots during the second half of Syracuse's 51-49 loss to Notre Dame. Mandatory Photo Credit: Kicia Sears, The Juice Online. The bubble. A word with many meanings but really only one meaning come February and March. A place some teams strive to reach. And a place where other teams look to get past. So where does Syracuse fit this year? On the bubble, of course. For the third straight year. Two years ago, Cuse snuck in and made the Final Four. Last year, the Orange was snubbed. This year, work needs to be done to rise above the bubble. And it starts with a win over UNC tonight. This is not the UNC of last year (champs) or two years ago (finalists). But they’re still UNC, and they’re ranked. Cuse needs to build off the Miami win. Get back in the conversation. Win two straight impressive games. Then we’re talking. We’ve seen a glimpse of the ceiling of this year’s team. It can absolutely beat a team like UNC if it’s on its A-game. There are really no excuses this time of the year. It’s late February. The big wins that come now, and any that happen later in the ACC tournament will stick in the minds of the committee. With the game against the Tar Heels and then one against Duke, these back-to-backs are an opportunity to show off. When Tyus Battle, Oshae Brissett and Frank Howard are on, they’re tough to beat. It’s been a thin roster this season with injuries and scholarship players. Just need to win a couple more games and this team is in. SU controls its destiny. Not many thought the Orange would even be in this position. But they are. And as I said in my last column, the last 10 regular-season games are crucial. And now so are these last few. And it starts with UNC, a beatable team. Win now, and don’t worry later. If only it were that easy, right?